My husband and I moved this week, and we now live in our RV on Watts Bar Lake in Tennessee. We have a beautiful view of the lake, right out our back window. Actually, we’re parked on a peninsula, so we can see water from every window in the RV. I began to wonder if the change in scenery would have any impact on my creativity, so I did some research. I found an article about how our surroundings impact creative thinking by Professor Juliet Zhu. She says that environmental factors such as color, lighting, and noise can trigger our creative thinking processes and productivity. And so … I’m wondering if I apply a “Blue WATER Thinking” approach to my practicing, would there be a similar effect? 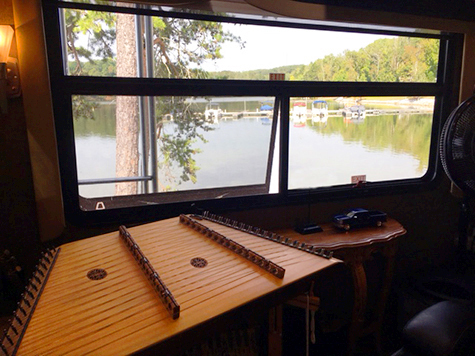 I’m going to stand in front of the dulcimer with my hammers at attention, look outside at our beautiful view of the blue water, and see what happens. Anyone want to make a prediction?